He may have guided Leicester City to the Premier League title the season before last, but Claudio Ranieri has left many Arsenal fans in a panic. That’s because the Italian tactician was spotted in the stands at the Emirates on Sunday, during Arsenal’s 4-1 win over Stoke City. 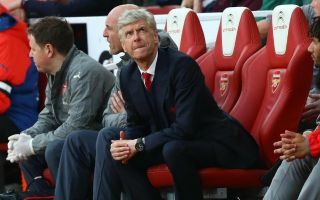 Given that it’s just a matter of days since Arsene Wenger announced that he would be stepping down as Gunners boss at the end of the season, it naturally led to plenty of speculation over a possibility that Ranieri could be a candidate to step in. There has been no official word to legitimise the link, but as noted in the tweets below, it may not be the most popular of appointments if it were to materialise. In his defence, Ranieri boasts plenty of experience at the highest level, having enjoyed stints in charge of Chelsea, Juventus, Inter, Roma and Valencia, while he’s currently Nantes boss. His title success with Leicester was undoubtedly special though, going against the odds to finish above the Premier League giants behind them to secure a memorable piece of football history. La presencia del técnico italiano Claudio Ranieri llamó mucho la atención de los medios hoy en el partido del Arsenal ante el West Ham. Claudio Ranieri in the stadium????? Ranieri at the Arsenal game? I wonder why ? Claudio Ranieri in stands watching Arsenal. He wants that job! Claudio Ranieri turned out at the Emirates. Mans tryna get a job on some “look at me, I did it with no budget” ?? Wtf was ranieri doing at the Emirates. If they even consider him. ?